True enough. But it’s not to say that a special bond can’t develop between a boy and his barber. The shop itself is a special world of masculinity, celebrated in film, song, and yuppie entrepreneurism. My barbershop long-term memories kick in around age 5 or so, in a Concord, California, strip mall. Your dad brings you to his barber—that’s how it works. I don’t recall that first haircutter’s name (I want to say “Bob”? Or “Mike”? ), but he was a smiling, slightly stocky, tan man—sort of a young Joe Torre. There was a waiting area with magazines to read. And I recall being referred to as “Big Jack.” Which was funny, because I was small. But made me feel kind of big. The next one I remember, at age 12, was the Center Barber Shop in the Princeton Shopping Center, New Jersey. This was a two-chair shop. My dad went to…wait, this guy was Bob…who was the proprietor, and my barber was Tony. Mustachioed with blonde, combed-back, product-enhanced hair, Tony was not the most masculine man I’d ever met. I’m not saying he was queeny (or that I even understood what that might imply), but we never discussed the big game or Phoebe Cates. He was kind and soft-spoken, and my eyes were always drawn to a stained-wood rectangular block on his counter, with unstained pieces glued to it that spelled out “JESUS” in some sort of optical illusion. Then I was off to college, in Pittsburgh, and for the first time had to choose my own shop. Not sure how I found Enrico’s—ad in the school paper, maybe? But I was immediately at ease. I believe Enrico Sr. cut there as well, but Enrico Jr. was always my guy. Didn’t hurt that he once described my hair as “a barber’s dream.” My friend Todd and I always got a big kick out of that. A barber can be a therapist too. For it was in the college years that I noticed more hair gathering in the shower drain, and, well, I started to panic. Was I transforming into a barber’s nightmare? Enrico said not to worry, hair was thicker at some times of year, thinner at others. He recommended massaging the back of the neck 100 times to keep blood flowing to the scalp. Medically sound? I don’t know. Calming? Yes. Post-graduation, life is a journey. What do you want to be when you grow up, and who do you want cutting your hair? 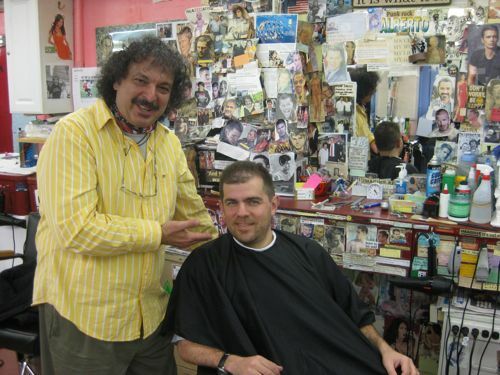 For a number of years I used barbers here in Hoboken. There was a two-man shop on 4th Street, with an elderly barber, and a stout, middle-aged fellow with a thick Italian accent. A Bob Hoskins type. My friend Joe and I joked about the older man, how he was “shaky and quaky,” but it was genuinely frightening when he’d approach your head with quivering sharp objects. I believe he retired, the shop closed, and his partner relocated to “Hair I Am,” conveniently just a block from my current apartment. I wasn’t crazy going to a whimsically named shop, but I do like continuity. However, I soon learned that Hair I Am’s owner gave me a vastly superior haircut. But how could I employ his services without offending my old paisan? If only I could figure out their days off. I am not a proud man and actually called up the shop, using a false voice to inquire. But the pressure was getting to me. A barbershop was supposed to be a happy place, a safe haven—not a den of deceit. I made a tough but important choice. I walked away, and never looked back. From that day on, I would be a client of Astor Place Haircutters in Manhattan. Was I giving up the personal touch? Astor Place is a monstrosity. Formerly a multi-floor shop, it now occupies a vast underground space just off Broadway in Greenwich Village. Autographed celebrity photos cover much of the available wall space. (I won’t begin listing them, but suffice to say, when magician David Blaine needs a trim, he knows where to go.) I’d first experienced Astor Place in my college-intern summer. But now I was back as a man. After some trial-and-error, not to mention the guilt of avoiding Suzy, one of the Eastern European female haircutters I’d used back in the day (they never forget a head), I ended up with Alberto. Soccer-obsessed Alberto. Italia. Juventus. He of the taped-up phrases all over his workspace: “Everything changes; nothing changes,” “It is what it is,” “Don’t worry; be happy,” and on and on. The months when a battery-powered dancing ape in a clown-suit sat on his shelf. Wednesdays off. Alberto’s lunch is at 2PM to 3PM. Thank you. The months when Tommy at the next chair over was missing, staying with his sick mom. Alberto plays Italian songs and we sing, when he can get the CD player to work, anyway. He joyously mocks my laugh. Grazie, Alberto, as I press a $3 tip into his palm. Recently, I reached a new status with Alberto when he accepted for his wall a phrase written by me on a Post-It: “Evil is not good.” It’s a tremendous honor, and I value the friendship I’ve developed with Alberto over the past several years. Sure, it’s surface-level, but isn’t that what a haircut is all about? Love the part about how the little you enjoyed being called Big Jack. Who does your barber, Alberto, look like?! Is it a singer? Not too long ago I had the shock of having two barbers die, several months apart. You only find out because the shop is closed (and it’s closed the next day, and the day after that), and no one answers the phone, and then a few weeks later a ‘for sale’ sign appears, and meanwhile you have to locate another barber, and that’s when you find out. And then you make some rough estimates and realize that you will probably outlive all of the Italian barbers in town, and maybe all the ones in America. Frank, that’s harsh and sounds statistically sound. Was that 4th St shop between Bloomfield and Garden? I liked that place, it was vintage Hoboken. Sad when it closed. That was the one! I believe it’s a legal office now.